A University of Alaska report found that an average of 74 percent of students who graduated from a subgroup of five state high schools had to take at least one remedial class when they enrolled at UA, even after many had already passed a comparative class in high school. The two-page report, with an accompanying joint statement from Alaska university and public school system officials, said the findings highlighted shortcomings in high school students' readiness for college-level work. Students requiring remediation must pay for the developmental credits that don't count toward their degrees and can face delays in college graduation to fit in the classes, if they graduate at all. "The students come and take remedial courses, and then they fail these remedial courses and leave," said Herb Schroeder, vice provost and founder of the Alaska Native Science and Engineering Program at the University of Alaska Anchorage campus. "If you're put into a developmental course, the chances that you'll ever get a degree are very low, and that's just wrong," UA President Jim Johnsen said last month. Schroeder spearheaded the recent report, which was provided to Alaska Dispatch News last month. His ANSEP program works with students starting in middle school. For the past two decades, he said, he has encountered students "woefully underprepared for college work." Over the past year, Schroeder said, ANSEP studied information about Alaska students who enrolled in the university system between fall 2006 and fall 2015. "We were shocked," Schroeder said of the report's findings about the number of students who had to take remedial classes and the high schools they attended. "We knew it was bad, but it's worse than we expected." The report is limited in scope, which some school superintendents criticized. It only examined Alaska schools with 10 years of graduation data and with 10 or more graduates enrolling at one of the UA's campuses in fall 2015. That whittled the total down to 37 high schools, eliminating small rural schools from the analysis. The report found that an average of 61 percent of students at the 37 high schools had to take at least one developmental class at UA. The rates ranged from 31 percent at Valdez High School to 78 percent at the Galena Interior Learning Academy. 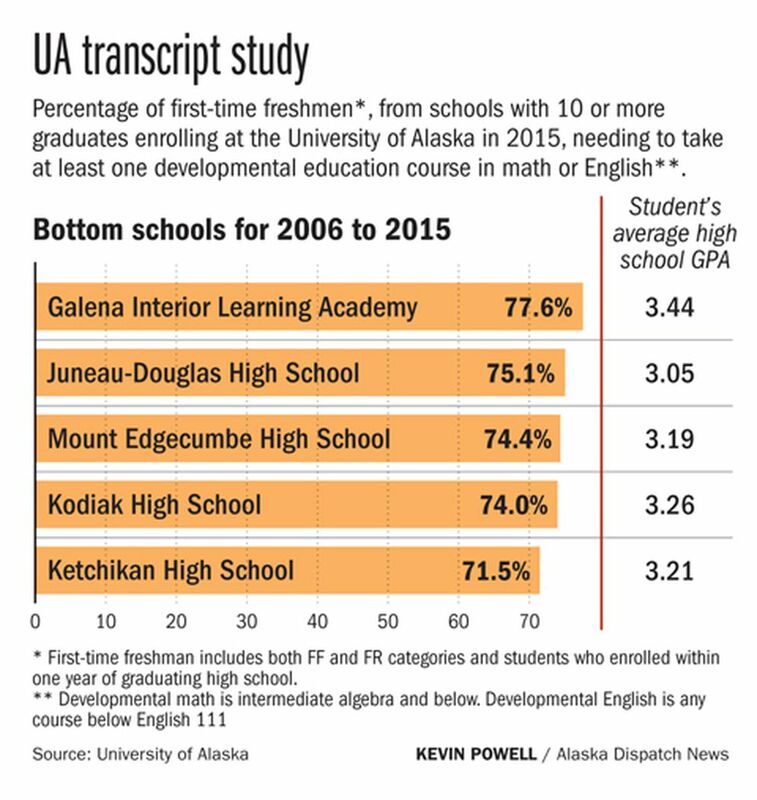 The report then further drilled down into data from five high schools with the highest average rate of developmental coursework over those 10 years: Galena Interior Learning Academy, a district-run boarding school; Juneau-Douglas High School; Ketchikan High School; Kodiak High School; and Mt. Edgecumbe High School, a state-run boarding school. About 74 percent of the 1,550 students who graduated from those five high schools and enrolled at UA within a year had to take at least one remedial class in math or English, the report said. Overall, the 1,550 students had an average, cumulative high school grade point average of 3.16. Schroeder said the students' strong grade point averages suggested that they were pushed through the school system and received diplomas without learning the material. "That's the thing that's most disturbing about the whole situation," Schroeder said. "The schools are telling the state that these kids are ready for college and they have this high GPA and their parents are being told that they have this high GPA, but then when they show up at the university, they're not ready." However, the superintendents that oversee the five high schools questioned Schroeder's findings. They said recent improvements weren't reflected in the 10 years of data that the study summarized into a single percentage point. "I wouldn't call it a study, it's more of a simple data pull," said Mt. Edgecumbe Superintendent Janelle Vanasse. "I think there are some risks when you do a simple data pull and you draw conclusions and you don't consider variables." Vanasse and other superintendents said the schools measure success by taking into account a number of factors including ACT and SAT scores, college scholarships, attendance rates, GPAs and more. Plus, some superintendents noted that a student's grade in a high school class also accounted for participation, homework completion and work on group projects — more than just results from an exam. Diane Hirshberg, director of the Center for Alaska Education Policy Research at UAA, said it was difficult to draw any conclusions from the report because the data did not indicate the total number of graduates from each high school and where students went who did not attend UA. She said the schools analyzed were also not a representative sample of the state's school system. "It's important to say how are we doing, but you have to look at all the students," she said. The University of Alaska is an open-access college and enrolls anyone who applies and meets minimum admission standards. Multiple superintendents pointed to a May 2016 study on UA developmental education when asked about Schroeder's report, and questioned the university system's method of placing students into the appropriate classes. A 42-page study by Oregon-based Regional Educational Laboratory Northwest concluded that high school grades were stronger predictors of college academic performance than SAT, ACT or placement test scores. It said success rates for UA students whose test scores said they should take remedial courses but instead enrolled in college-level courses had much higher success rates. While each of the five superintendents interviewed pointed to problems with Schroeder's study, they also said they were committed to working toward improvement. "You work with kids as you get them, how you get them, and you adjust your instruction to meet kids where they are," said Kodiak Island Borough School District Superintendent Stewart McDonald. Schroeder said that to him, the report's findings represented an immediate call for action and change. "There's no doubt about the integrity of the data," he said. According to UA statistics from the 2015-16 academic year, 44 percent of first-time freshmen enrolled at campuses across UA and seeking a four-year degree had to take a developmental math or English course, while one in two students seeking two-year degrees had to take a developmental course — both higher than national percentages. "We have to fix the problem," Schroeder said, "and the first step in fixing something is accepting the fact that it's a problem." State Education Commissioner Michael Johnson said when students receive a high school diploma "it should mean something." "It should mean that you're ready for a job or you're ready to go to college and take college-level classes and for far too many of our students it doesn't mean that." Corrections: A graphic in an earlier version of this story incorrectly stated how the study defined developmental math. Also, the story misstated the role of UAA's Office of Institutional Research in the ANSEP study. The office provided data to ANSEP, which analyzed the material to arrive at a report.